Career Opportunity in Bahria Town karachi. 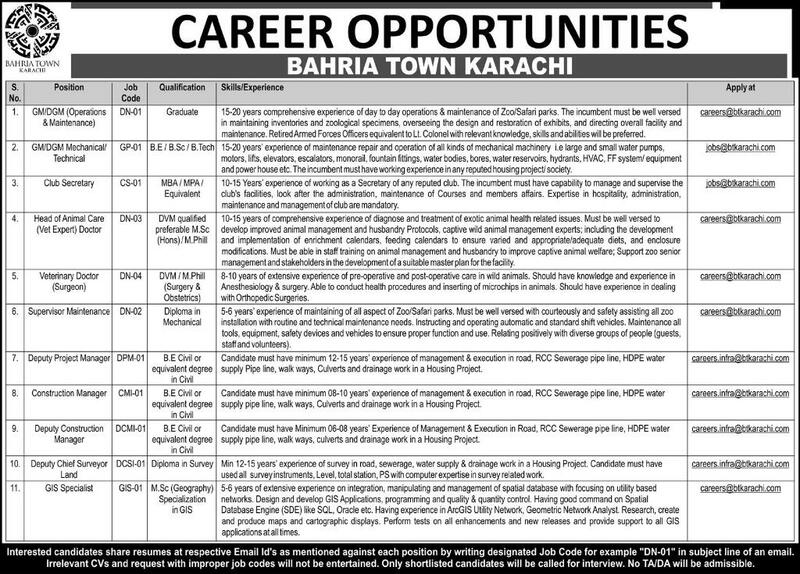 Bahria Town Karachi has Announced New Jobs in Daily Express Newspaper 09/03/2018. Candidates who have required Qualification and Experience may apply for Bahria Town Karachi Jobs 2018 for GM/DGM Operations and Maintenance, GM/DGM Mechanical/Technical, Club Secretary, Head of Animal Care, Veterinary Doctor, Supervisor Maintenance, Deputy Project Manager, Construction Manager, Deputy Construction Manager, Deputy Chief Surveyor Land and GIS Specialist. Interested Candidates may send their resume at Email Address mentioned Against Each Post by writing Designation Job Code.